Scotland’s Carly Booth is just two strokes behind compatriot Catriona Matthew in the Ladies irish Open at Killeen Castle. 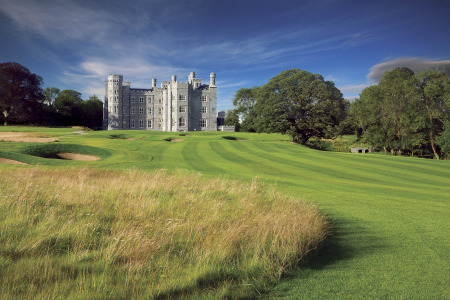 Photo Jenny Matthews/www.golffile.ieNorwegian world No 6 Suzann Pettersen can make like hell for the leaders as she chases down her third Ladies Irish Open title in five years at Killeen Castle today. The 31-year old defending champion began the day five shots of the lead but cut the gap to just three on pace-setter Catriona Matthew of Scotland after a late eagle three. Matthew added a 71 to her opening 67 to lead by two shots on six under par from 20-year old compatriot Carly Booth and Sweden’s Pernilla Lindberg. But Pettersen hit a five iron to 20 feet at the signature seventh, her 16th, and rolled in the putt en route to a 69 that left her alone in fourth place on three under. “I had a lot of great chances today and I’m in one the final groups so hopefully we can make a run at it,” said Pettersen, who won the title at Portmarnock Links in 2008 and again last year. “I’m here to defend my title so I’ll do whatever I’ve got to do. I’m three behind so I guess that’s two closer than I was last night, so a good day’s work and one more day to go. None of the Irish made the seven over par cut with 17-year old Cavan amateur Leona Maguire coming up just one short despite a brilliant late rally alongside Pettersen and four time champion Sophie Gustafson of Sweden. Under pressure after an opening 80, she birdied the par-five seventh with two putts from the fringe to get back to level for the day and needed to pick up a shot at one of the last two holes to make the weekend. In the end it was not to be as she burned the edge from 20 feet at the eighth and 12 feet at the ninth, eventually carding a 72 to finish on eight over on day of squally showers, sunshine and preferred lies. “I really got it going on the back nine and gave myself lots of chances but the putts just didn’t go in,” Leona said. “It could easily have been a lot, lot lower but the damage was done yesterday. “I knew on the seventh tee that the cut was going to be seven over and that I needed birdies coming in. My putts on eight and nine were so close but I guess it was not meant to be. Leader Matthew, 42, raced to the turn in three under par when she birdied the first with a seven iron to four feet, hit a sand wedge to three feet at the third and then chipped to six feet to set up another birdie at the par-five seventh. At eight under, she looked likely to motor into a commanding lead but she three putted the 11th for bogey from long range and whole she birdied the par-five 12th with a wedge to five feet, she slipped up coming home. She bogeyed the 13th after a bunkered tee shot and while she made a two-putt birdie after two great shots to the 500 yard 15th, a double bogey six at the dangerous 17th, where she drove into the water, has left the tournament wide open. Fellow Sco Booth had five birdies and a late double bogey at the 16th in three under 69 to move into contention for her third win of the season following victories in the Scottish and Swiss Opens. With Leona’s twin sister Lisa Maguire withdrawing with a left wrist injury on Friday after an opening 85, Irish hopes are pinned on Galway born American Alison Walshe, who is tied for sixth on level par after a 71. Rebecca Codd finished on 10 over after a 74 with Danielle McVeigh (80) on 12 over and Tara Delaney (84) another shot further back. Catriona Matthew tapped in from a couple of inches for her ninth career win. 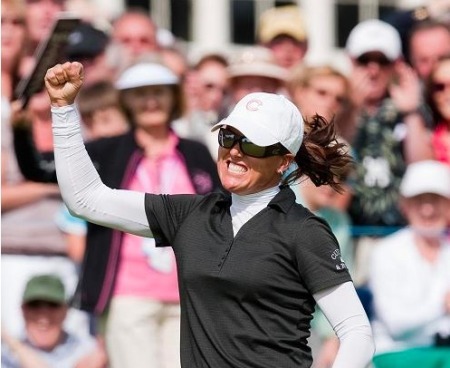 Photo by Tristan Jones (LET)Scotland’s Catriona Matthew held off a dramatic back nine challenge from defending champion and Solheim Cup team mate Suzann Pettersen to clinch a one-stroke, wire to wire victory in the Ladies Irish Open at Killeen Castle. 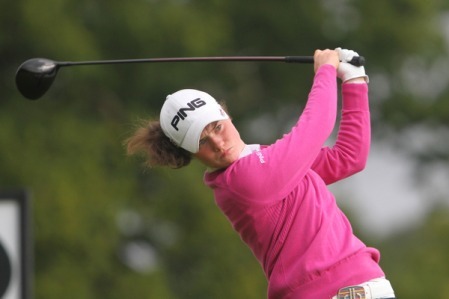 Leona Maguire in action on the opening day of the Ladies Irish Open at Killeen Castle. 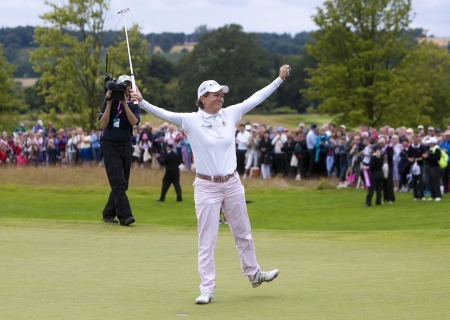 Photo Jenny Matthews/www.golffile.ieWhile it’s said that the key to happiness is a bad memory several member of the European side that recorded that sensational Solheim Cup victory over the United States last September might beg to differ. McIlroy back in the ball game? McDowell: "You have something to fight for as opposed to chewing your shoelaces"